“Syria said it would cease production of chemical weapons and disclose the locations of its stockpiles to the United Nations, Russia and others, as Damascus seized on a possible diplomatic route to avert international military action,” the Wall Street Journal reported today. The first half of that sentence is factual and the second half is interpretative. The media and others have been so quick to assume that the Assad regime’s swiftness in responding positively to Russia’s initiative is an expression of fear — that it serves as a demonstration of the effectiveness of the threat of force — few have paused to consider an alternative motivation: that giving up chemical weapons may ensure Bashar al-Assad’s survival and ultimate victory. One thing about which no one should be in any doubt is that the Syrian government understands better than anyone else does, what would be involved in destroying its chemical weapons stockpiles. For them, this isn’t an abstract proposition. Syria’s agreement to give up its chemical weapons will likely mean its acceptance of an undertaking that may take as long as a decade to complete, says Cheryl Rofer, who supervised a team destroying chemical warfare agents at Los Alamos. The only people with the technical skills to carry this out are the U.S. and Russian militaries. Teams assigned with this task would have to operate with the protection of the Syrian army. 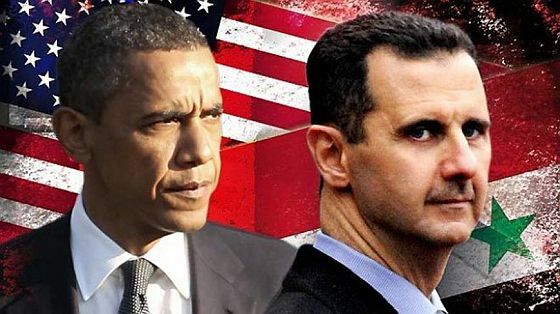 The only way of ensuring that the operation could successfully be completed and that chemical weapons could be prevented from falling into the hands of opposition militias would be for Assad to remain in power. The United States and Russia would in effect become the guarantors of Assad’s continuing rule. Moreover, even if a deal is finalized and all the relevant governments sign on, due to continuing fighting it might be months or years before its implementation even begins. No wonder Damascus has been so quick to seize this opportunity. Foreign Policy reports: Russia’s proposal for Syrian President Bashar al-Assad to place his chemical weapons under international supervision and then destroy them is quickly gaining steam. Assad’s government accepted the plan this morning. A few hours later, President Obama, British Prime Minister David Cameron and French President Francois Hollande announced that they’d seriously explore the proposal. It already has the backing of United Nations Secretary General Ban Ki-moon and a growing number of influential lawmakers from both parties. There’s just one problem: the plan would be nearly impossible to actually carry out. Experts in chemical weapons disposal point to a host of challenges. Taking control of Assad’s enormous stores of the munitions would be difficult to do in the midst of a brutal civil war. Dozens of new facilities for destroying the weapons would have to be built from scratch or brought into the country from the U.S., and completing the job would potentially take a decade or more. The work itself would need to be done by specially-trained military personnel or contractors. Guess which country has most of those troops and civilian experts? If you said the U.S., you’d be right.